The European Union's Emissions Trading Scheme (EU ETS) is the world's largest market for carbon and the most significant multinational initiative ever taken to mobilize markets to protect the environment. It will be an important influence on the development and implementation of trading schemes in the US, Japan, and elsewhere. However, as is true of any pioneering public policy experiment, this scheme has generated much controversy. 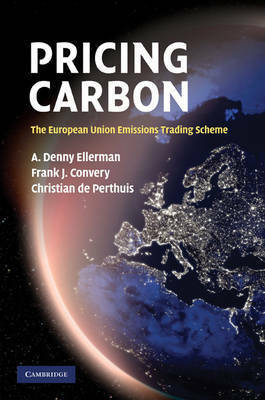 Pricing Carbon provides the first detailed description and analysis of the EU ETS, focusing on the first 'trial' period of the scheme (2005-7). Written by an international team of experts, it allows readers to get behind the headlines and come to a better understanding of what was done and what happened based on a dispassionate, empirically based review of the evidence. This book should be read by anyone who wants to know what happens when emissions are capped, traded, and priced. A. Denny Ellerman is Senior Lecturer at the Sloan School of Management, Massachusetts Institute of Technology. Frank J. Convery is Heritage Trust Professor of Environmental Policy at University College Dublin. Christian de Perthuis is Associate Professor of Economics at the University Paris-Dauphine and Head of the Mission Climat of the Caisse des Depots, France. Emilie Alberola is Research Fellow at the Mission Climat of the Caisse des Depots, France. Richard Baron is Head of the Climate Change Unit at the International Energy Agency, France. Barbara K. Buchner is Senior Energy and Environment Analyst at the International Energy Agency (IEA), France. Anais Delbosc is a researcher at the Mission Climat of the Caisse des Depots, France. Cate Hight is Research Fellow at the Mission Climat of the Caisse des Depots, France. Jan Horst Keppler is Professor of Economics at the University of Paris-Dauphine and Director of the Energy program at the French Institute of International Relations (IFRI).